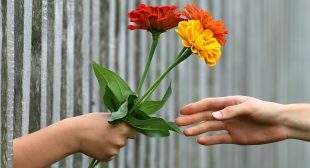 The concept of giving more and getting more is quite alien to many, however for me, I have always thought it made complete sense. In the past though, I had always seemed to give but get nothing back in return which did actually bother me somewhat. There appears though to have been some sort of paradigm shift in that since working on myself through the Master Key Experience now, I am giving and good things are happening in return. Perhaps it was just that previously I had not noticed the getting as a consequence of my giving but now I certainly am. I am noticing so many more kindnesses in others too and this is so uplifting. 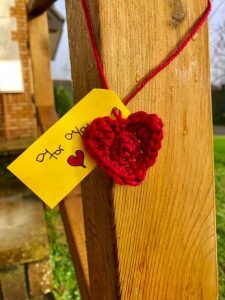 Over the last week or so, somebody as yet unknown has been leaving small knitted hearts on peoples’ door handles and in obvious places around the town. It making people feel happier and such a kind gesture. I am seeing my shapes and colours everywhere constantly. They are constantly reminding and nudging me towards my PPN’s and my DMP. Though I am hitting a few bumps along the way, I am certainly on the way thanks to the Master Key Experience and seeing the shapes and colours is really helping. This week, I am focusing on taking initiative as part of my makeover. I have come up with a number of things to take initiative on which is absolutely fantastic for both my life and my business. It feels like a shame that I have to sleep as I could carry on all day and night right now as I am buzzing with enthusiasm. I have had a few bumps over the last week or so, most particularly around my ‘sits’ and visualising. Throughout my MKE journey so far, I have generally found my sits quite simple to manage but recently I have started my sit and encountered a complete blank which has been a little disconcerting. I am however persisting and succeeding. You seem to be on the right track and that the work that you put into this is really paying off. Great work!